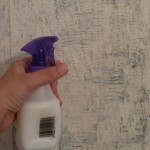 Budget bathroom redo: Wallpaper removal…check! Our first stop in the Budget bathroom redo is the the stripping of the wallpaper. Yup, I know exciting right. I don’t think this is a job that makes anyone go jumping out of bed, but with a some time and elbow grease think we it’ll totally be worth it . If you remember our wallpaper used to inspire me to burst into a chorus of U.G.L.Y you ain’t got not alibi…ala Bring It On. 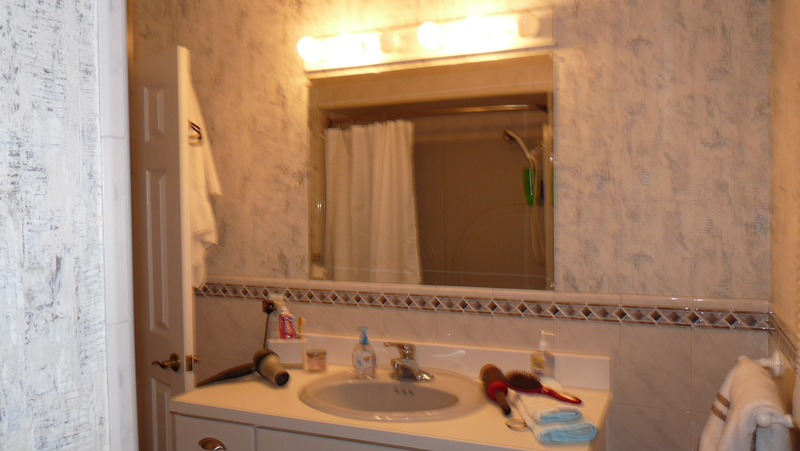 Here’s what our bathroom looked like with the U.G.L.Y wallpaper . See how it’s already starting to lift up in the corner? It’s begging to be stripped, right? Yeah, that’s what we thought too. Oh wallpaper how I’ve wished for you to be gone for so long. Here’s the step by step guide on how we nixed our nasty wallpaper. 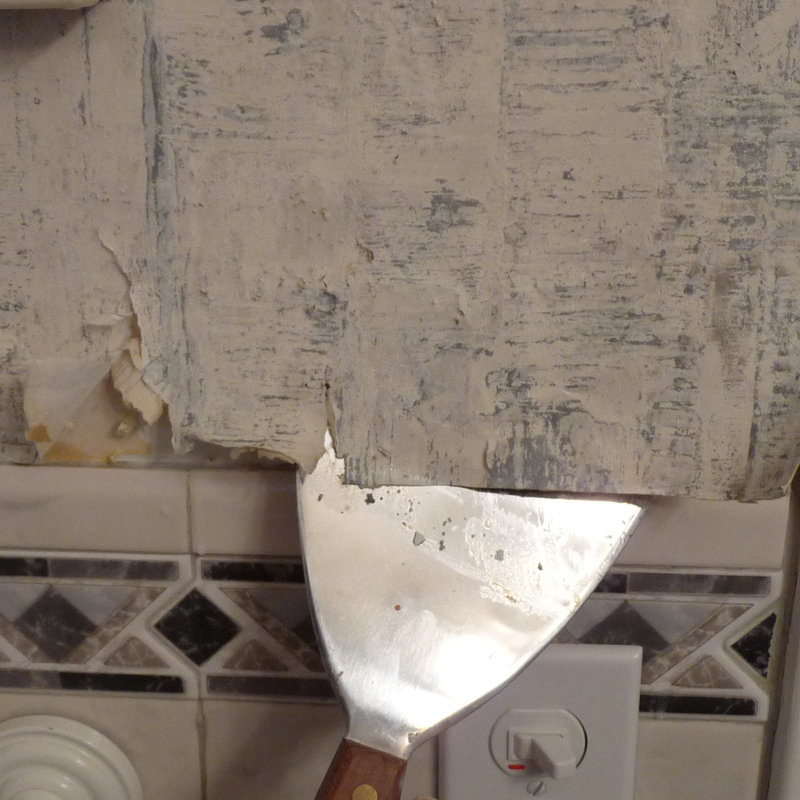 Step 1:Loosen the corner with a putty knife. 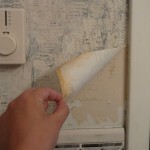 Slide a putty knife under a seam in the wallpaper. 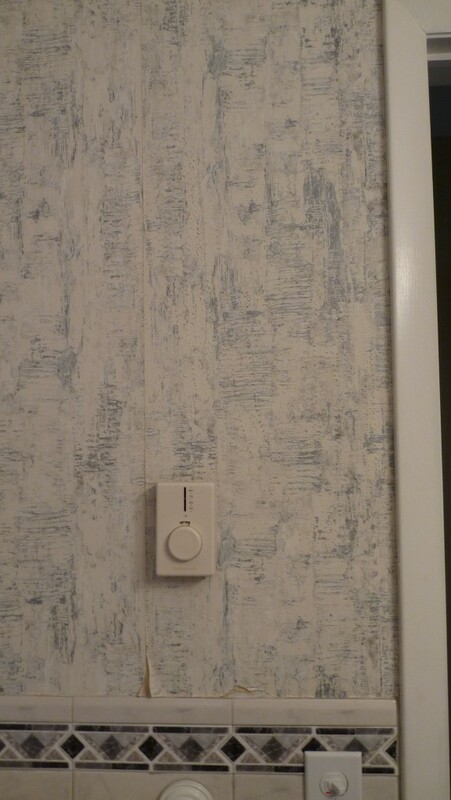 Slowly loosen the wallpaper from the wall. IIf you’re wallpaper is anything like ours, it’s already peeling in some corners. Step 2: Start a’peelin. 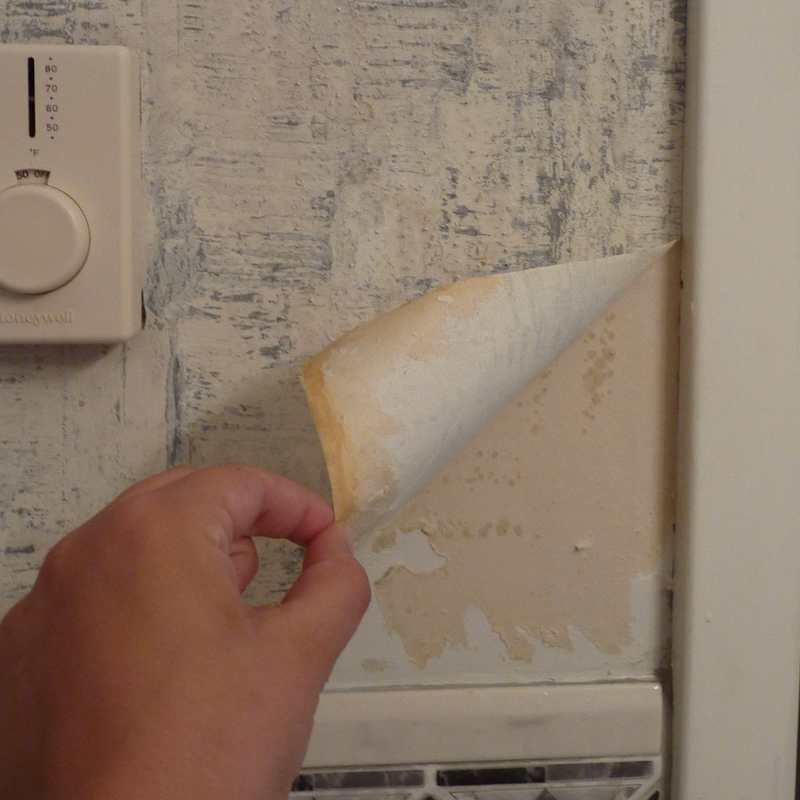 Slowly start peeling off the top layer of the wallpaper. I’ve learned from some cleaver internet research if it peels off easily then BAM you’re golden otherwise you’re in for hours of tedious scouring, steaming and scraping. 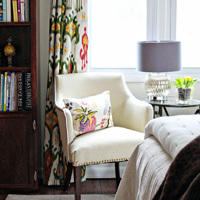 Peel the decorative backing off of the walls in the entire room. Step 3: Scour Spritz, Spray. 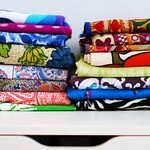 Start by mixing fabric softener in with Hot water. We used 1 capful to one small spritz bottle. After we peeled back the top layer we were left with the paper backing that originally held the glue. We bought one of those scoring tools and tried that a couple of times but found that just the fabric softener and water left to soak for 10 minutes did the trick. Tip, shut off the electric in the room in case any water you spray runs down your walls into the electrical boxes. Step 4. Scrape, Scrape, Scrape. Once the Hot water and fabric softener have time to work it’s magic, scrape the paper backing with a putty knife. We’ve heard some horror stories of people not being able get the old wallpaper off the walls. 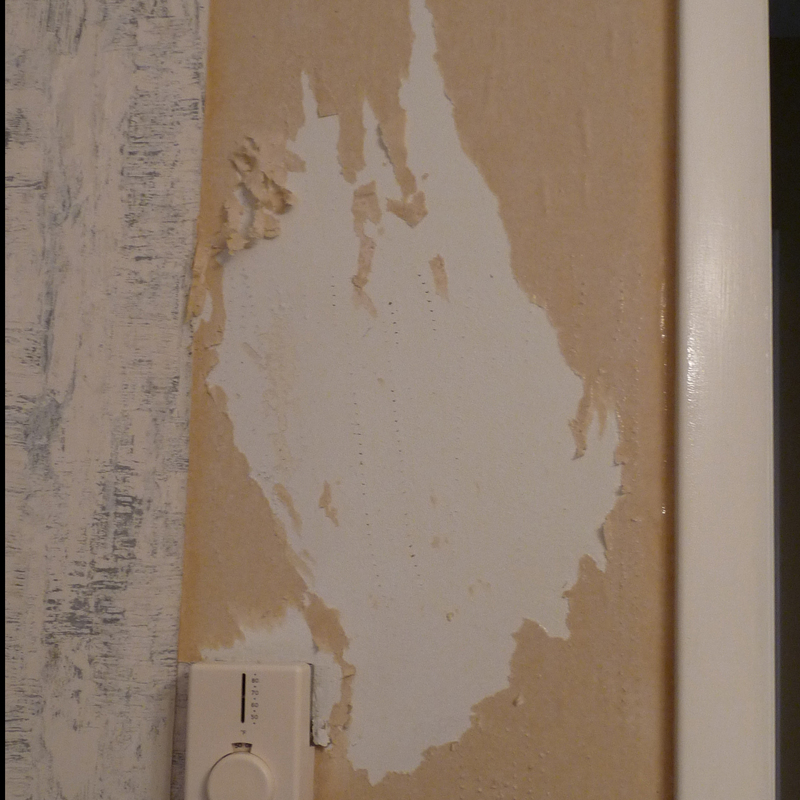 Fortunately for us ours scraped right off the wall with just a little elbow grease. Step 5. Tidy up. We’re not kidding this is a messy job. That’s really all there is to it! 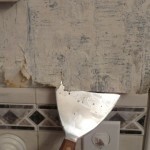 With a little time and some scraping you too can bid rid of that ugly wallpaper! 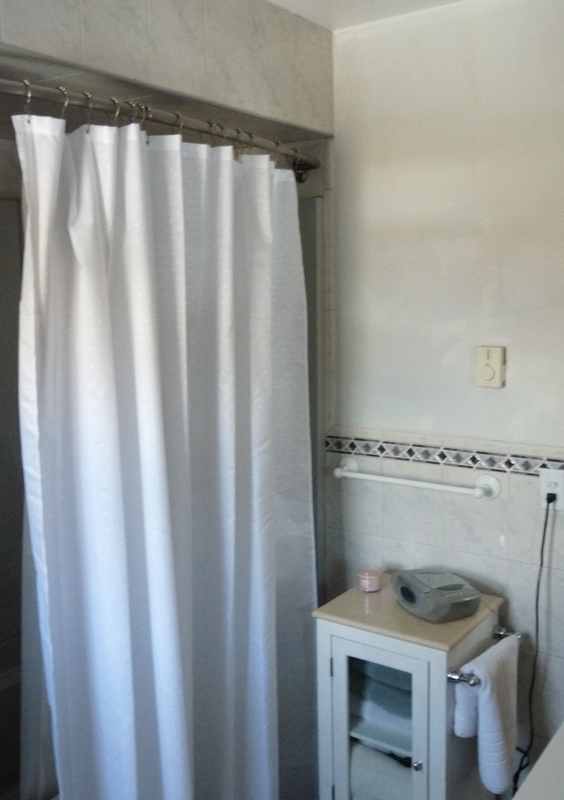 Here’s a look at how the bathroom was before we took the wallpaper down. And here is after, ALL READY FOR PAINT! 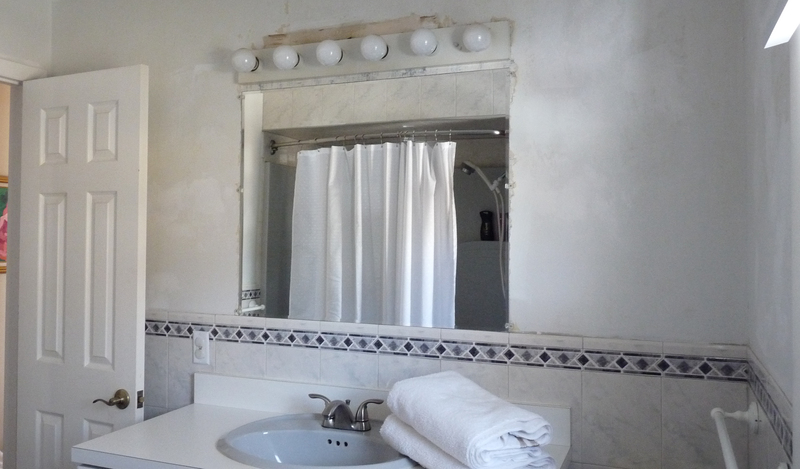 Our bathroom has left much to be desired in terms of reflecting our style. At the moment it functions well so we can’t justify ripping out all of the hard surface and starting from scratch while there are so many other projects to be done. 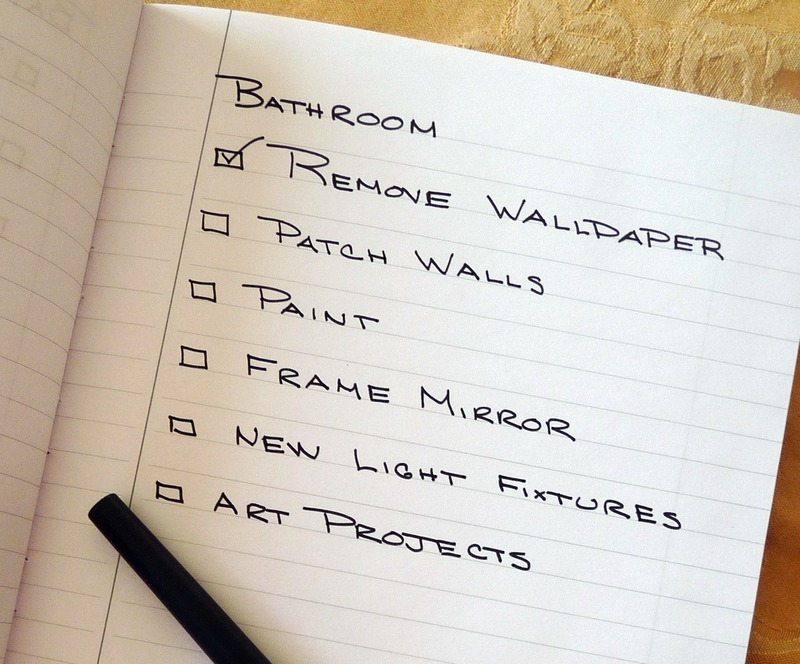 However we do want to spruce the bath up a bit by changing certain elements and updating what we can while we work through our other projects on our list. Eventually we’ll make our way back to the bathroom for a full-Monty type makeover. Right now this is how the bathroom stacks up. 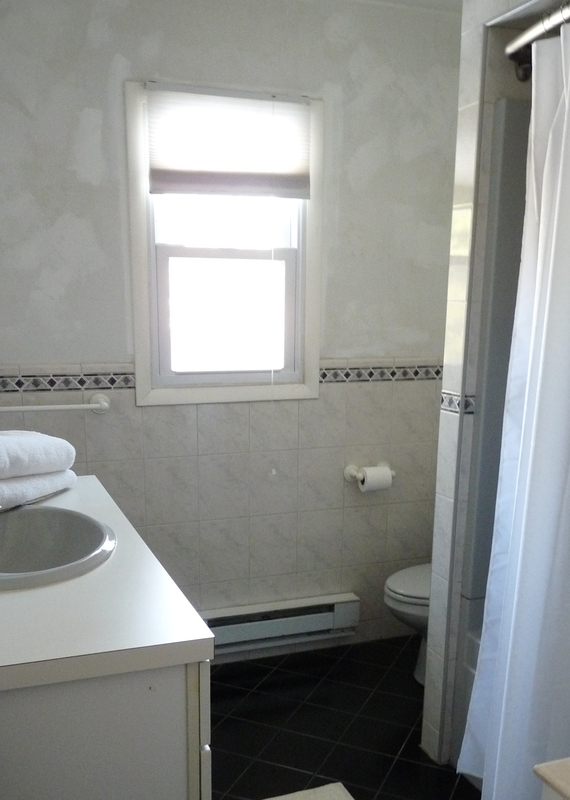 The floor tile is a matt black 4 x 4 tile. Wall tile has a gray vein pattern with a black and gray diamond accent border. 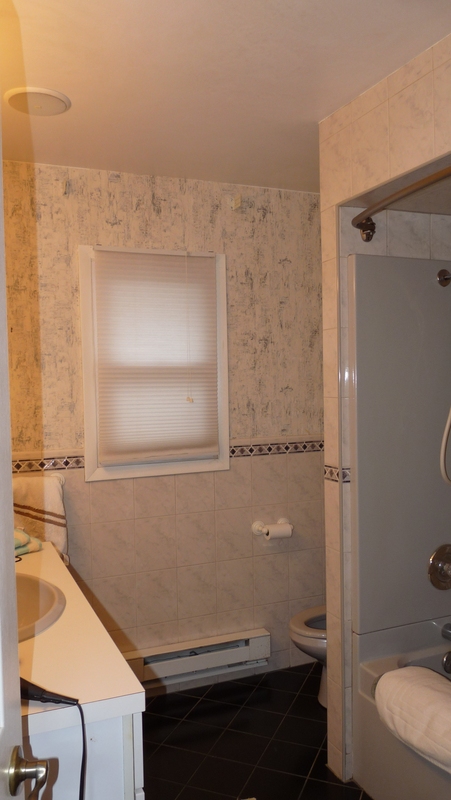 The tub, shower and sink are gray/blue color which matches the wall tile. We have a fabulous $9 light fixture (no joke I saw it at home depot) which is total function without any form and the finally the wallpaper has a gray and blue splatter paint quality that makes me sing U.G.L.Y you ain’t got no alibi you ugly. Since we’re not taking out any of the fixtures at the moment we need something that will compliment the grayish blue quality of the wall tile and fixtures, a complete renovation is out of the question for the moment, we’ll need something that will work with what’s currently there while not breaking the bank. 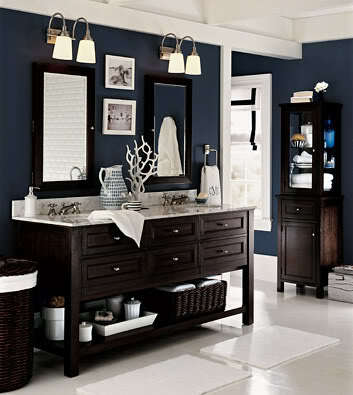 When we began talking about our budget friendly bathroom remodel found an inspiration photo with a blue wall color. I know it’s bold but I think it’s just the cure for the current drab state it’s in now. I think the blue and white scheme will go nicely with our current tiling a fixtures and will look cohesive when it’s all said and done. So even though the existing tile wouldn’t be our first choice it’ll look like it belongs in that bathroom when we’re finished. 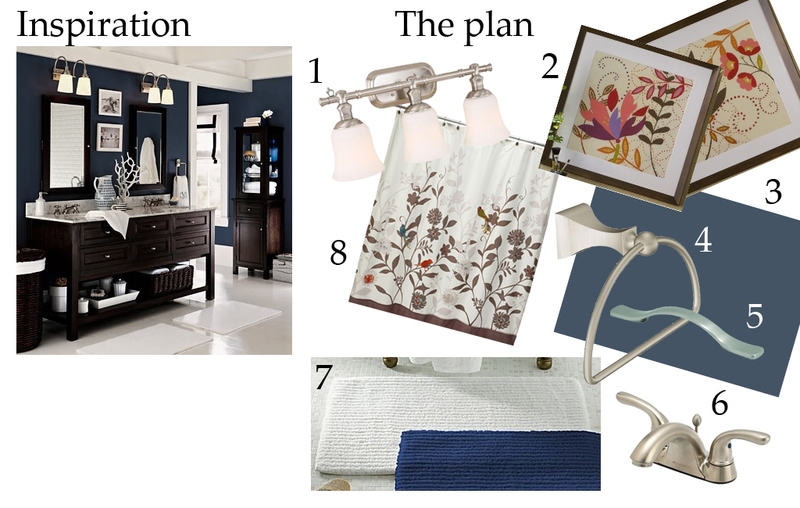 After finding our inspiration photo I began putting together the plan to bring this look home. 1. Hampton Bay 3 light vanity, $59.96–We need to swap out our builder $9 light fixture, it’s currently the only light source in the bathroom. We think this one will compensate for the removal of the blinding light of the 500 wattage light fixture we currently have and provide a soothing spa like lighting situation. 2. Berry Blossom Giclees, $369,96–I love these prints from one of my favorite sites, Ballard Designs but at $369.96 they’re a bit out of budget for our budget bathroom redo. 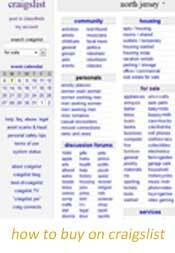 I have a plan to create my own which I’ll be posting soon. 3. Benjamin Moore Paint, Newburyport Blue –Yup it’s bold but we think it’s just the right punch of color to liven up our gloomy gray bathroom. 4. MOEN Retreat Towel Ring, $16.42 –I think towel rings are much more convenient than towel bars, they hold the perfect size towel for drying your hands without the “only for company” towels propped up on a towel bar. 5. Hickory Hardware Satin Nickel Euro Pull, $6.17 — Nothing updates any cabinet quicker than adding new cabinet pulls. We like the clean lines of these pulls to bring the whole brushed nickel we’ve got going on together. 6. Glacier Bay Faucet, $34.00 — We’ve looked high and low but nothing compared to the Glacier Bay faucet we found for the price. 7. American Living Hamilton Bath Rug, $12.99-$49.99 — These rugs from JCPenney in white will be the perfect soft touch underfoot to brighten up the black floor tile. 8. Daintree Fabric Shower Curtain, $39.99 — I like the fluid lines of the flower design on this curtain, combined with the gray tones and pops of color it’ll be the perfect accent to some of the harder elements living in the bathroom. So that’s where we’re headed, next stop stripping down the wallpaper we’ll keep you posted on the step-by-step of the stripping process. After we bought our Lake House back in November of 2009 the first change was refinishing the beautiful hardwood flooring that existed under the dingy white carpet. You can read about that in The first change and in Fun times in floor refinishing. Once the winter had passed and we started to come out of hibernation we began to focus our attention on the greater outdoors. First stop, the garden in the back of the house…or should I say the front? Lake houses have peculiar way of the back facing the road (what would usually be considered front) and the front facing the lake. 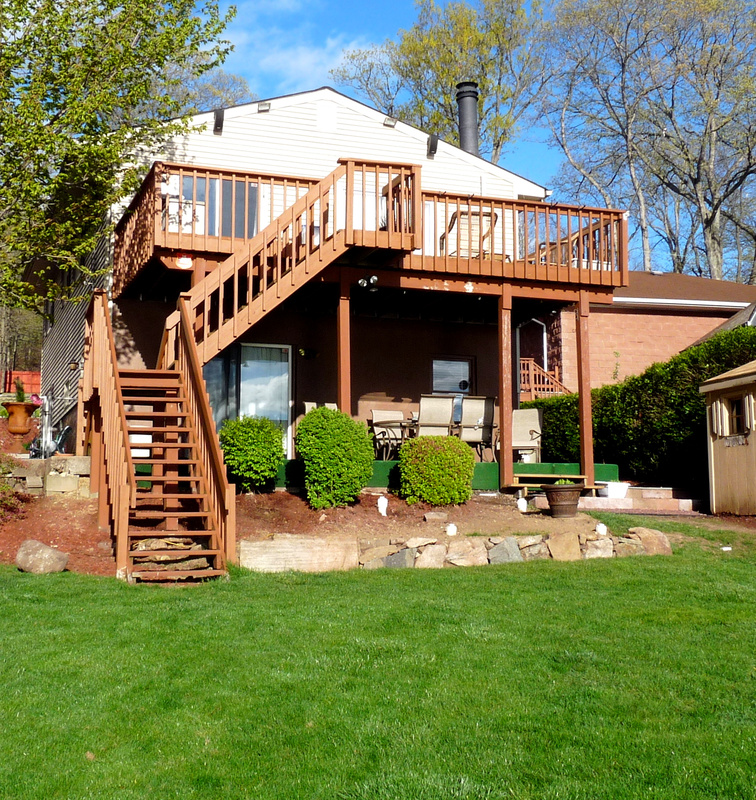 Our yard slopes downward towards the lake so the key to creating nice areas to plant and relax is in the creation of levels or rooms within the yard. The entire plan is for the first level to be the decks and top gardens, the second level include the grassy area, horseshoe pits and vegetable garden, the third level will include steps to a deck surrounding the above ground pool, the fourth and final level will focus on the lake some shade structures and possibly some kind of tiki bar and seating (fingers crossed). We started by laying out the new first level garden, cutting in a straight line and removing the grass that was in the area now designated as garden space. Due to the slope of the yard we knew we wanted a raised bed suitable for plants and to make it more visually appealing by breaking up the space. 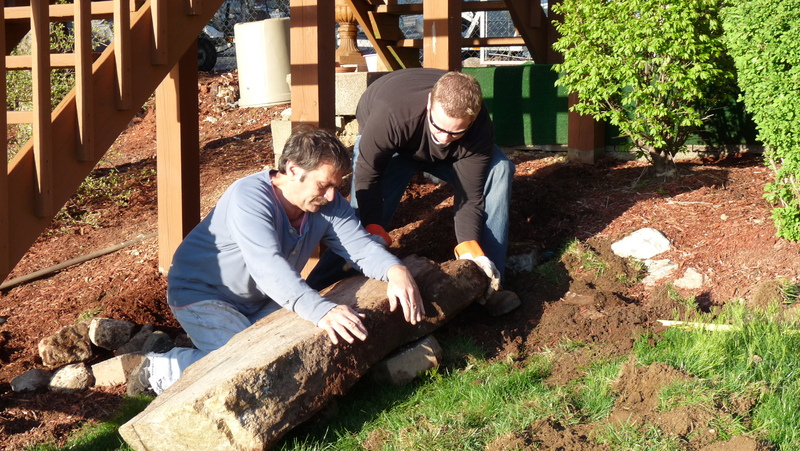 The idea cornerstone for the raised bed began with a large flat rock that was lying in the garden. It took some elbow grease, a couple of shovels, a pry bar, 2 men and some determination to move into place. 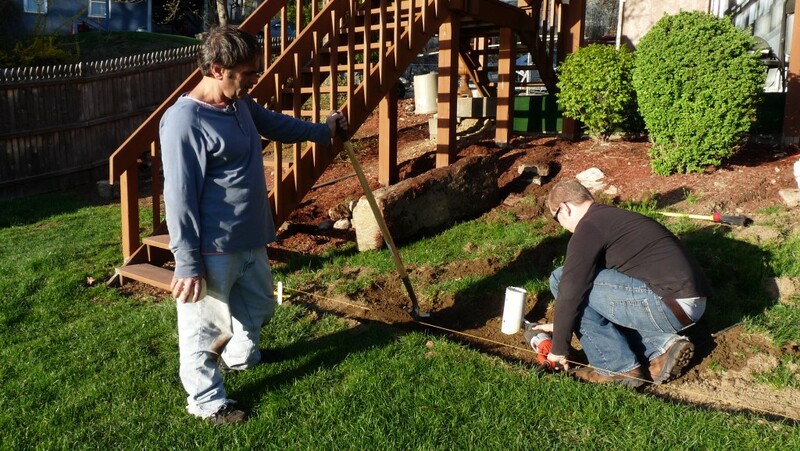 Once all the rocks were in place we had the basis for our raised garden bed and first level of plantings. 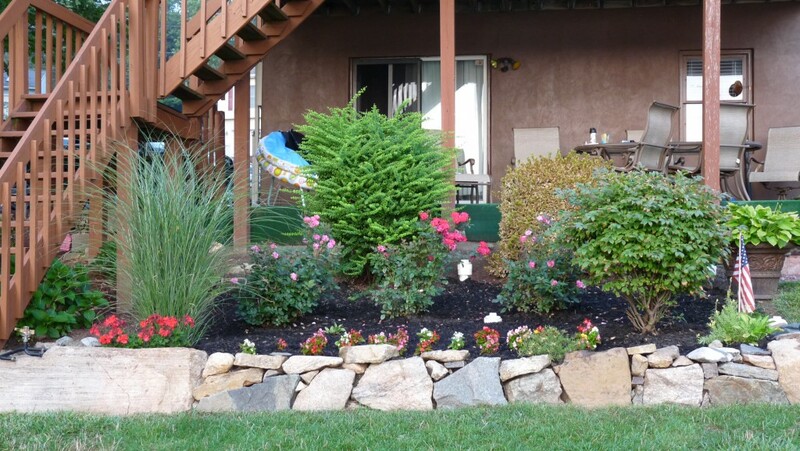 With the help of a few trips to the garden store our first garden redo looks like this! We used the original shrubs that were already there moving the burning bush to the front right corner. We bought some additional Plants to fill in the space. You can see a breakdown of the plants outlined below. Plants above: 1. Maiden Grass; 2. Cotoneaster; 3. Azaela; 4. Hostas; 5. Burning Bush; 6. 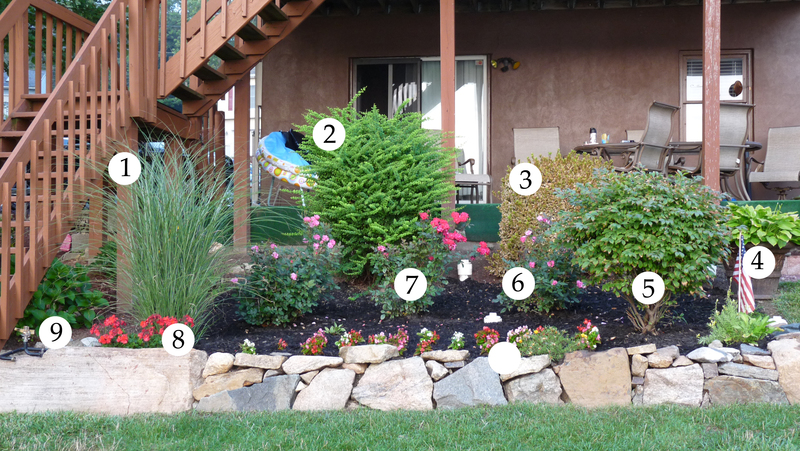 Shrub Roses; 7. 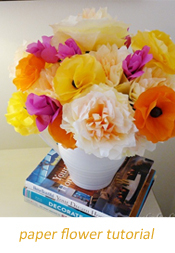 Begonias; 8. Geranium; 9. 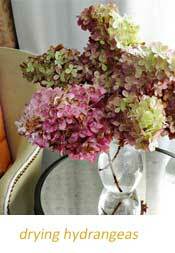 Hydrangea.